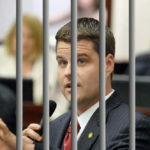 Earlier this afternoon, Republican Congressman Matt Gaetz decided to commit felony witness tampering in plain sight when he posted a tweet threatening to ruin Michael Cohen’s marriage ahead of Cohen’s scheduled public testimony tomorrow. Gaetz will be indicted for this, and could go to prison for it. But instead of deleting the tweet, he’s decided to make it even worse for himself. Much worse. So there goes any opportunity for Matt Gaetz to try to convince a jury that when he sent the tweet, it wasn’t really in relation to Michael Cohen’s status as a witness. In other words, Gaetz really does appear intent on going down with the ship. Here’s the remarkable part: Gaetz isn’t even on the House Oversight Committee, so he won’t be a participant in the questioning of Cohen. In other words, Matt Gaetz just gave away that there’s a larger conspiracy among House Republicans to try to intimidate Michael Cohen out of incriminating Donald Trump during his public testimony tomorrow. Whatever it is, it’s been plotted in advance, and Gaetz just stupidly blew it by bragging about it in public beforehand. Gaetz is toast. Which other House Republicans are going down with him? There are about to be fireworks indeed.